Bluesy psych-rock outfit Chris Robinson Band has earned praise from heavyweights like former Grateful Dead members Phil Lesh and Bob Weir. Robinson, best known for his role as vocalist for the Black Crowes, brings listeners through a stream of reflective and rhythm jams that truly stand on their own. The band just dropped a brand new album, Any Way You Love, We Know How You Feel, and are playing an intimate two-set performance on Oct. 7 at Cannery Ballroom. You can still snag tickets here, but we’re also giving away a pair of tickets to one lucky reader. Click below for more on the lineup and for your chance to win. Blues rock outfit Chris Robinson Brotherhood was fittingly founded by Chris Robinson, vocalist of the Black Crowes. The project was originally started as a sort of L.A. based jam band in 2011. Robinson recruited fellow Black Crowes member Adam MacDougall, Neal Casal (a former member of Ryan Adams’ band the Cardinals) as well as bassist Mark Dutton and George Sluppick on drums. Their initial idea of staying close to California quickly vanished when they hopped on a massive national tour just months after forming. The following year, they released their debut album Big Moon Ritual, an experimental mixture of psychedelic rock and blues that quickly won over critics. Three months later, they released their follow-up LP The Magic Door, which was recorded at the same time as their debut. This quick succession in releases and steady touring helped build up a steady fanbase in record time. However, the group decided to hunker down and refocus on bring a fresh and well thought out sound to their third release. In 2014, Phosphorescent Harvest brought a new level of free-spirited West Coast rock that mixes in elements of classic Americana and funky 1980s synth pop. In many ways, Chris Robinson Band’s new album Any Way You Love, We Know How You Feel returns to the sound of their debut. A bit more restrained and soulful, the record takes listeners through a trippy ride that’s filled with sonic highs and lows. Give it a spin before you see them take the stage for this special two-set performance that’s sure to leave you spellbound. Winner will be announced Wednesday, Oct. 5, and will receive one pair of tickets. Good luck! Win Tix To Chris Robinson Brotherhood! 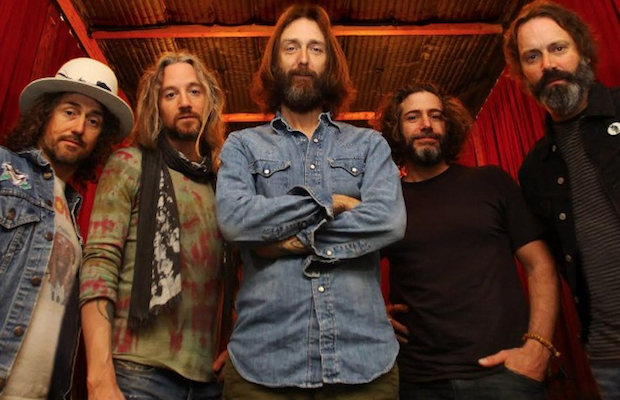 Chris Robinson Brotherhood will perform Friday, Oct. 7 at Cannery Ballroom. The show is 18+, begins at 9 p.m. (doors at 8 p.m.), and tickets are available to purchase for $20. Stream The New Release From Milk People & Catch Them On Saturday at The End!